Church's Stained Glass has been in business for over thirty years. We are a family owned business, operated by Barbara Church Coffelt and son, Jayme Church. During this time we have participated in numerous art shows craft fairs, mostly in the middle Tennessee and northern Alabama area where we have won many prestigious awards including the Bill Grigsby Memorial Award for excellence, from the Cleveland Creative Arts Guild, Nillie Bipper -Best of show, The Tullahoma Fine Arts Center - Best of Show, and Webb School in Bell Buckle, Tn.- Best of Show. Barbara has recently retired from teaching school, allowing for more distant showings of our art in places such as Ohio, Indiana, Georgia, and Kentucky. In addition to doing art shows and craft fairs, we do custom work for the home, such as front doors, windows, side lights and transoms, cabinet panels and etched shower doors. We have produced decorative glass for numerous businesses, such as large door panels for restaurants along with dividers and logo panels.We are experience in building Church windows as well, in any and shape,size and style. For smaller sized residential work we use the Tiffany's technique of copper foil, which allows us to produce more intricate and detailed work.We are also skilled in leaded glass, which is the preferred method for Church windows and larger pieces due to the stability of the reinforced lead, a requirement associated to the weight of larger work. Much of our art work is from original designs which enables us to meet your specific decorative needs, but we also employ the use of pre-made designs for those who have a specific pattern in mind. 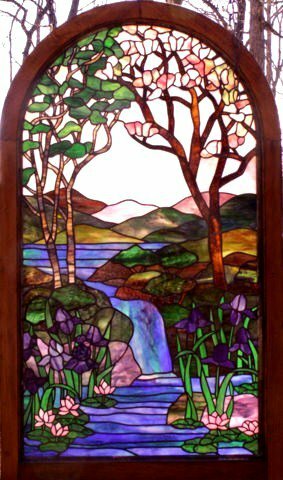 We have created many beautiful landscape scenes, produced several extravagant abstract designs and we often work with beveled glass which involves using a bevel cluster as the focal point and designing the stained glass around it. Some of our work involves sand carved designs produced Jayme Church. Jayme is skilled at multi level sand blasted glass as well as single level etching and implementing shading techniques, providing shadowing effects and creating incredible realism in his etching. 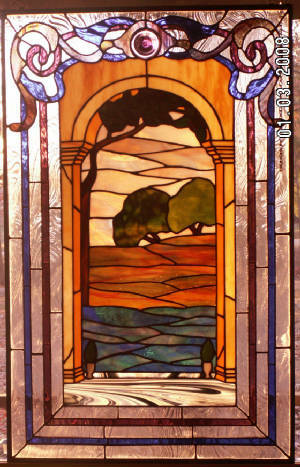 We are able to fulfill any size and space requirement, as well as any custom color needs.Our pricing is very reasonable when compared to other Stained Glass, starting at $95 per square foot, but the quality of our art work is top tier, so contact us at 931-967-0477 and let us bring beauty and elegance into your space. We are ready to bring our brand of joy to you!